O.K., sure, I write about Oshkosh a lot here on Airplanista. I’ve you’ve been to the show, you know why. If you have never been to the World’s Largest Aviation Celebration, you may not be able to understand how this show stays with you all year, and the memories you make there stay with you for life. 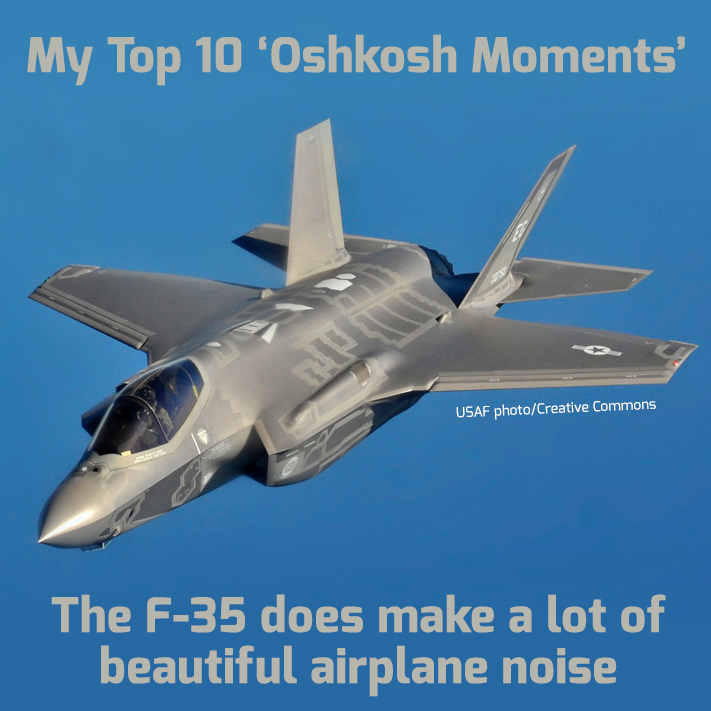 It got me thinking about some of those cherished “Oshkosh Moments” I have experienced over the years. I was sitting at a table outside a café in the Vintage area, surrounded by row upon row of exquisite restored vintage airplanes. Across from me was David Fill, who produces the Airplane Owners Podcast. He was interviewing me for a segment on his Oshkosh coverage, and we were both chill and enjoying the moment. As he recorded the interview, we both heard the distinct sound of fighter jets approaching overhead. It was getting louder – much louder – and coming from west to east. All of the sudden, that sound EXPLODED as a pair of F-35 Lightning IIs came roaring over the field, burners on (or so it seemed). The sound was so loud (and also so glorious) that I heard it set off hundreds of car alarms across the show grounds. The F-35s did a few laps around the patch, and a few more high-speed passes. I am sure their “airplane noise” could be easily heard all the way up in Green Bay. While this was happening, David kept trying to finish the interview, and each time he tried to ask me a question, here came the F-35s. After a few tries, we both just laughed and he finally just turned off the recorder on his iPad. When the noise finally subsided, we both looked at each other and knew we had just experienced a classic Oshkosh moment. Where else can you be sitting amongst acres of vintage airplanes representing the Golden Days of aviation, and be blasted by two of the very latest, most awesome and technologically advanced fighter jets? I looked at David, he looked at me, and without a word, we both knew this was a very rare experience. This is the kind of thing that can only happen at Oshkosh. Yes, it is possible to have your hair parted by a pair of F-35s, but if you want to have that happen while rubbing elbows with hundreds of flying museum pieces while eating yet another Brat sandwich, surrounded by 600,000 of your BFF #avgeek friends, that can only happen here at this show. Its times like this that keep me coming back every year. Stay tuned right here for the next chapter in this 10 part series coming soon.